The Cranbrook Plan has now been published in submission draft form. This was discussed at the Council’s Strategic Planning Committee on 20 February 2019 and at the meeting of the Full Council on 27 February. Authority has been given to carry out public consultation on this version of the plan and for the plan to be submitted to the Secretary of State for independent examination. The public consultation runs from 11 March until 5pm on 24 April 2019. During this period, a static display to tell people about the Plan is available to view in the foyer of The Younghayes Centre, Cranbrook. Paper copies of The Cranbrook Plan and the accompanying Sustainability Appraisal are also available to view at East Devon District Council’s offices at Blackdown House, Honiton. Submission of comments can be made electronically by email to plancranbrook@eastdevon.gov.uk or by post addressed to: The Cranbrook Plan, Planning Policy, East Devon District Council, Blackdown House, Border Road, Heathpark Industrial Estate, Honiton, EX14 1EJ. If making comments by email or post you are strongly encouraged to use the standard representation form to ensure that comments are related to matters relevant to the subsequent examination by an Inspector. Comments can be submitted using an online questionnaire which replicates the standard representation form. Guidance notes on completing the representation form are available. If you are objecting to the proposed submission Cranbrook Plan and wish to speak at the examination, it is imperative that you make this clear on your representation form. You may request that we notify you of: when the plan is submitted for examination; when the Inspectors recommendations are published; when the plan is adopted and/or any other planning policy issues. 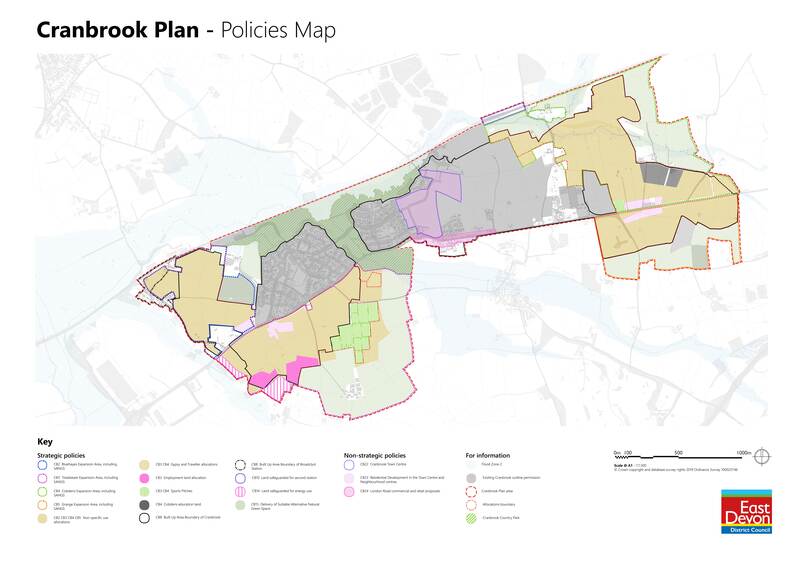 The Cranbrook Plan Submission Draft and Policies Map are also available, along with supporting evidence and procedural documents. A lower resolution PDF version of the Policies Map, designed to be A4 printer friendly, has also been made available. Any personal information which you provide will be held and used by East Devon District Council for the purpose of preparing the Cranbrook Plan Development Plan Document and may inform other planning policy work. Your information may also be shared within East Devon District Council for the purposes of carrying out our lawful functions. Otherwise your personal information will not be disclosed to anybody outside East Devon District Council without your permission, unless there is a lawful reason to do so, for example disclosure is necessary for crime prevention or detection purposes. Your information will be held securely and will not be retained for any longer than is necessary. There are a number of rights available to you in relation to our use of your personal information, depending on the reason for processing. Further detail about our use of your personal information can be found in the relevant Privacy Notice.